My boyfriend and I met while travelling in America and endured a long-distance relationship between Adelaide and Melbourne for a year. To celebrate our first meal together as a couple in Adelaide after I decided to make the move, my beau wanted to surprise me. As we drove towards Glenelg, I was sure we'd be at a restaurant overlooking the beach and looking deeply into each other's eyes as the sun set; I was partially correct. The beach wasn't our only view but all of Adelaide. 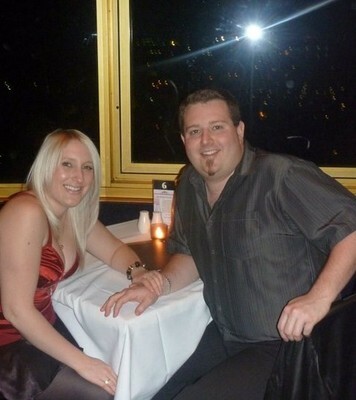 I was wined and dined at The Top of the World Revolving Restaurant. With 360-degree views of Adelaide taking in the city skyline, the hills and the beach, there couldn't have been a better way for me to appreciate all of Adelaide. 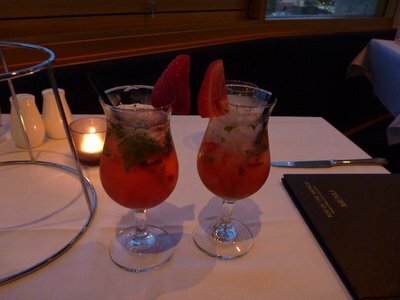 We were shown to our table by a full length window and the novelty of knowing the restaurant was moving ever-so-slowly as we sipped strawberry mojitos made me giddy with love, mind you, and not vertigo! The food was delicious. 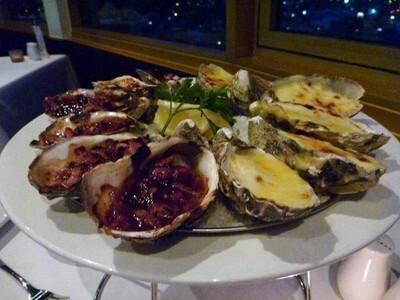 Specialising in seafood, we began our romantic meal with garlic bread followed by the definition of romance- oysters. Unlike the usual fresh or oysters Kilpatrick, we shared a dozen including Oysters Mornay- oysters drenched in béchamel and cheddar cheese sauce. With food this rich and decadent, I couldn't help but smile with each slurp as the sun sank below the horizon. As we ordered our mains, the lights of Adelaide began to flicker. 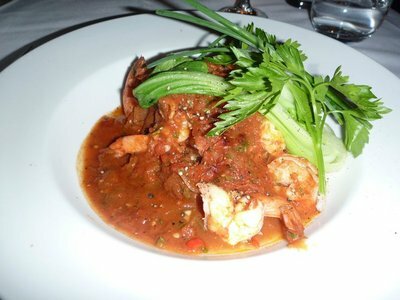 My partner chose Sambal Prawns for his main dish, rich in red from the chilli and tomatoes in the sauce. 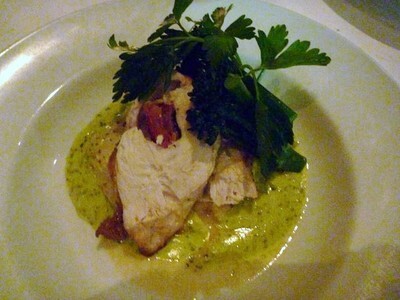 I chose the Chicken Breast filled with creamy brie, semi-dried tomatoes and a creamy pesto sauce, served on a bed of mash. Our meals tasted fresh and the servings weren't so big that getting through it becomes a challenge. We were able to savour each mouthful and I even let my partner have a taste- I never share my food. Due to having two gluttonous entrées and separate mains, we were unable to take advantage of the desert menu, usually my favourite part of a meal. I was quite satisfied though and with high tea available on Fridays and Sundays from 2-4pm, I can tell I'll be back for an indulgent afternoon. During our date, the staff were attentive without intruding on our date. There were several other couples dining, ensuring the mood was relaxing and ambient with dim lights, a tea light candle at each table and soft music playing in the background. Tempted? Then waste no time. 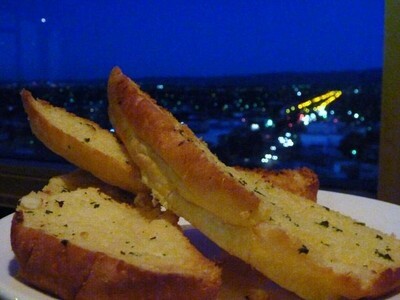 Tease your taste buds by viewing the menu online at www.topoftheworld.net.au, make your reservation online or by picking up the phone and dialling 8376 0050 and dress in your Sunday best for a night you won't forget. Why? With 360-degree views of Adelaide taking in the city skyline, the hills and the beach, there couldn’t have been a better way for me to appreciate all of Adelaide. When: The Top of the World Revolving Restaurant is open for lunch on Saturday & Sunday from 12pm-3pm and dinner Tuesday-Sunday from 5.30pm-til late. Where: Level 12, 760 Anzac Hwy, Glenelg.